A lot of home cooks shy away from buying large pieces of meat and whole fish and poultry, mostly because they aren't comfortable breaking them down into smaller portions at home. Those convenience cuts are convenient for a reason! But understanding the different parts of the animal and how best to cook them is truly an art form. 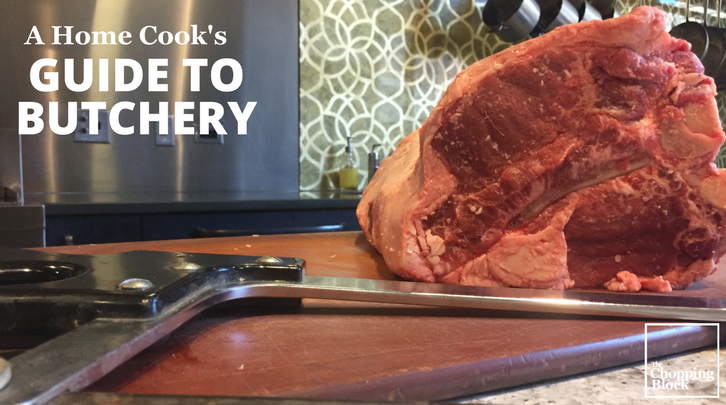 We want you to consider your butcher your bestie and utilize them as well as the knowledge in this guide to become familar with breaking down a chicken, cutting your own steaks, cleaning a pork tenderloin and fileting a fish. Once you master these techniques, you'll see the benefits of home butchery, including some pretty major cost savings! and more resources to keep learning. Whether you are handling a whole chicken for the first time or you've been doing it your entire life, feel confident taking matters into your own hands with the help of The Chopping Block's guide. Just fill out the form to download our Guide to Butchery.